gigs | Next goal wins laaaaaaads! Saw a band play at the Aylesbury Civic Centre a fair few years ago. Just starting out then – Jangling guitar riffs, shirts buttoned up to the neck, floppy fringes masking scowls and bum fluff tashes. The band were hip enough for me to get enough respect after the gig from the bunch of year 10 lads. They were also there to enjoy the show. I bumped into quite them literally as they pushed and slammed around auditorium. I do not know who was more surprised to crash into who. So the band are still hip now, seven years later, but beards have replaced those wispy moustaches and they get interviewed by the Guardian to publicize their new tour, rather than rely on word of mouth and posters. Nothing grabbing you so far, well something is bothering me. The Bristol show of this latest tour is at the Bristol University Student Union. A pretty large venue for Bristol, which has no big events arena, but will do soon. The whole tour went on sale simultaneously and the Bristol tour date, along with the other gigs went on sale today (21/8/15) at 9 am. Can I get on to any of the ticket agencies online at 9 o’clock? Nope. but I do get through to one site that allows me to book 0 tickets at £27.50. It is 9.16 am. Sold out. Hard luck, I hear you say. Agreed, but when you see the same tickets being offered already at 9.30 am at three or four times their face value on online re-sale sites, it rubs salt in the wounds. It is all wrong. 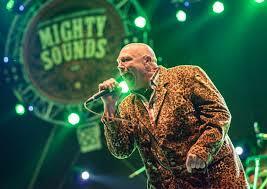 was a post written 2 years ago when Buster Bloodvessel was laid up in hospital in Italy. At the time it did not look good. It was even reported in the NME that the front man from Bad Manners was in a bad way and obituary writers were being summoned in readiness. However all is well with the big man, which puts a smile on my face. As in my recent trawl of various ticket agency web sites to see which forthcoming The Hives gig was nearest to me I saw the list of bands due to play at the Reading festival next month. There they were, Bad Manners, and with a future Christmas count down tour lined up too. I might even go to the Fleece on December 15th and see them for myself! It has been a while. Anyway Buster looks the picture of health to me – here he is playing Mighty Sounds festival in the Czech Republic in June. Good news I say.